A sad time, Declan. I didn’t know Kieron well, but I met him a few times through Timmy and Martina, and had the pleasure of hearing him sing on a few occasions, including the night in Ballyduff when he sang ‘My Way’ and other songs with them (‘Lough Sheelin Eviction’ was one – a song I’ve never heard anyone else sing). Also in the concert for the opening of Munterconnaught GFC’s new facilities last year, when he, Timmy, Martina and Geraldine Keogan performed a version of ‘All the Lies’ that was the highlight of the evening … just brilliant. A really nice guy, and a huge loss. Sorry to read this Brendano. I do love all the guys who play it live on your doorstep. We so often take music and singing for granted but we should cherish each and every moment we come together in song – the magic moments. Thanks, PapaG. You’re right, of course … those are the magic moments, and Kieron was someone who lived life to the full. 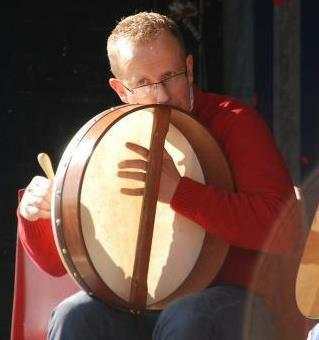 Timmy is planning to have a big music session tomorrow night (the night of the funeral) to give him a good send-off. We are Ok thanks, tho doctor thinks I have a chest infection so had another X ray on Friday. Nothing too serious I’m sure. I will be thinking of you all on Monday evening and hope you rip the roof off, well sort of! I am sure the occasion will pull everyone together. Shame there aint more of that kind of thing in England. Thanks, PapaG. I’ve had a bad cold/chest infection myself for the past few weeks; starting to get over it now. It’s a great community, as we have found out, and Kieron’s family will have a lot of love and support in what is going to be a very tough time for them. My heartfelt sympathy to his family. I am so glad I had the privilege of meeting him. He waits now in the glory of God’s Presence. I remember the night this video was taken, In Ballyjamesduff raising money for the Pink and Gold cancer charity, We were very raw in our grief for Sean. I remember when Kieron sang “My way” I got emotional and tears started to stream down my face. I put my head down and no one noticed. Now he has gone too. It’s heartbreaking.